As ruler of the Franks, Charlemagne unifies nearly all Christian lands of Europe into a single empire. In December of 800 Charlemagne was crowned Emperor of the Romans by Pope Leo the 3rd. He converted even his enemies to Christianity. 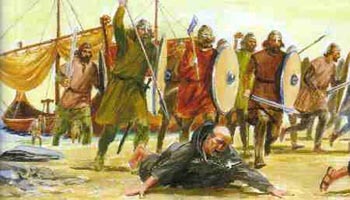 The Vikings made their first raid in Lindisferne, England. The Vikings used shallow longships which helped them attack quickly and surprise their enemy. This was the start of the Viking Age. 1066-1350 Britians population tripled during this time. Feudal society began and foreign invasions ended. Food production grew. Forests were being cleared and more land was used for food. William invaded and conquered England. William bought feudalism from France to England. They fought the battle of hastings. William became King of England. The Guild set standards and protected their members (like our modern labour unions). This provided fair pricing and quality of workmanship which protected the consumer and the maker. The guild protected the workers with proper working conditions and work hours were regulated. Chinese chemists mixed together a combination of saltpeter, charcoal and potassium nitrate that would form the explosive and powerful powder called gunpowder. Gunpowder was soon used as a powerful additive in explosive weaponry. This was brought to Europe through the silk trade route in the 13th century. This brought a totally new concept in warfare that is still widely used in armies and terrorism today. Guns, muskets and cannons could be used to conquer fortresses and the new world. Without the use of gunpowder our world would be completely different today. So, take away gunpowder and what would have changed in history. Fighters would only have swords, spears and arrows. This would have made taking over lands and empires next to impossible. Joan of Arc is burnt at the stake. She helped france become a nation. She was only nineteen years old. The Longswords were used. They had longer blades and easier grips for two hands to hold it. They would give fearce cuts and gave fighters good reach. These longswords were mostly used in the middle and late medival period. This period of architecture had lots of stone, arches and the barrel vaults. Oil paint was introduced to the world of Art. Leonardo Da Vinci paints "The last Supper"
Leonardo DaVinci paints the famous Mona Lisa. Michelangelo finished painting the entire ceiling of the Sistine Chapel in Rome.